A mohair cinch is made of smooth, durable fibers from the hair of an Angora goat. Mohair cinches for saddles are strong, durable, washable, and naturally antibacterial. They are a favorite among cowboys and cowgirls for their strength, good looks, and strong ties to tradition. Below are mohair cinches for sale. The cinches are both straight cinches and also wider roping cinches. eBay, Etsy and Amazon are all excellent sources to find mohair cinches. This area lets you compare the prices and selection between them on one page! ...if you're buying a cinch that will be made according to your specifications when you order. Mohair Information: What Is Mohair? Mohair is a fiber made from the hair of an Angora goat. Mohair is durable, washable, and has moisture wicking properties to carry moisture away from the skin. Mohair fibers can take a lot of twisting and bending without becoming damaged, and the fibers are difficult to crush. It is also a strong fiber: It is not only stronger than sheep's wool, it is also stronger than steel of an equal diameter. Another plus to mohair is that it is naturally antibacterial: Since mohair fibers are long and smooth (unlike sheep's wool which is crimped and scaly) they naturally resist bacteria. Below: An Angora goat. 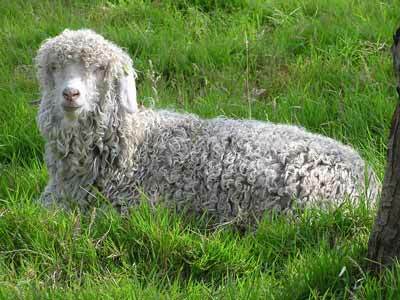 Mohair is made from the hair of Angora goats. 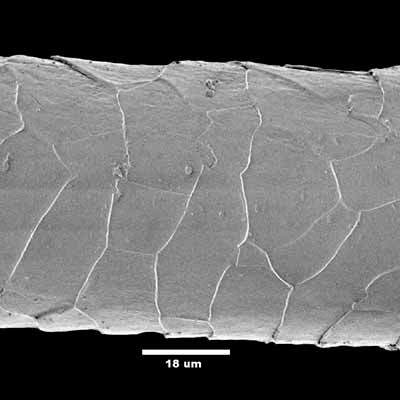 Below: An electron microscope scan of a mohair fiber. This fiber is 18um long, which is equivalent to 0.000708661 of an inch. Compared to sheep's wool, mohair is stronger, and also stronger than steel of an equal diameter. In addition, mohair is a smooth fiber, making it naturally antibacterial. Mohair is harvested from Angora goats by shearing. Unlike sheep which are typically shorn only once a year, Angora goats are typically shorn twice a year. Mohair is prized worldwide as a luxury fiber. It takes dye extremely well, and is commonly dyed into a wide range of vibrant colors. It provides excellent warmth and insulation in cold temperatures, but is cool in the hotter temperatures thanks to its ability to wick moisture. While many of us in the horse industry think of mohair as the natural fiber cinches are made of, it is used to make a nearly endless variety of other products as well. Other items commonly made of mohair include clothing (coats, sweaters, socks, scarves and more) and home furnishings such as carpeting. It's also used to make the luxurious fur of teddy bears or other stuffed animals, as well as the hair of some high-end dolls. Below: A mohair cinch on a working cowboy's saddle. Buying A New Mohair Cinch: What Size? The best way we have found to buy a new cinch in the correct size (length) is to measure an old cinch that fits the horse and saddle and simply buy a new one the same size. 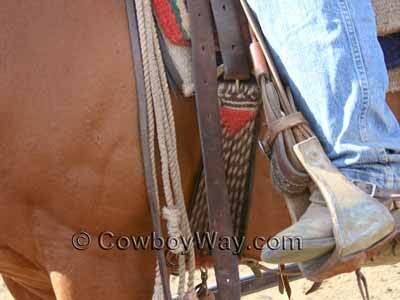 Calculating your horse's cinch size using the method above is not always accurate. 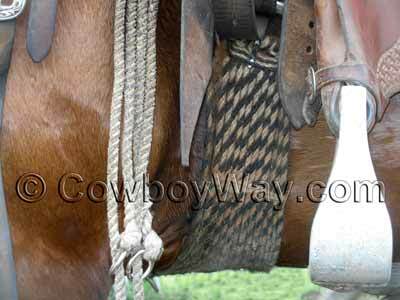 There are enough differences in styles of cinches, saddles, and horse body types to make any method of measuring for a cinch little more than an educated guess. Like we said earlier, measuring an old cinch (if you have one) that fits the horse and saddle well would be a better way of finding out a good size for a new cinch, but that's not always possible. If you have to make an educated guess, however, the method above is a good place to start. If you find a mohair cinch you like on Amazon but you're not ready to purchase it right away, you can always add it to your shopping cart so it will be easy to find later. In most cases, Amazon will keep track of your cinch, and anything else in your shopping cart, for 90 days. In the meantime, if you want to check out with other items, click "Save for later" to move the mohair cinch to a separate, but still easy-to-find list beneath your shopping cart.